Hudson Shuffleboards is the Fastest Growing Shuffleboard Manufacturer in the World for one simple reason: We offer the highest quality handcrafted shuffleboards at an unbeatable price. Regardless your skill level, Hudson Shuffleboards are a perfect addition for the home, bar, business or clubhouse. Using the finest craftsmanship only found right here in the USA, we handcraft our top of the line tables to provide years of fun and entertainment. Our tables are used in professional tournaments and are backed with the best warranty on the market. Just another reason why Hudson Shuffleboards are the #1 choice among the top players in the world. Try us and find out why thousands of people have turned to Hudson Shuffleboards! All shuffleboards can be customized with your Custom Logo. 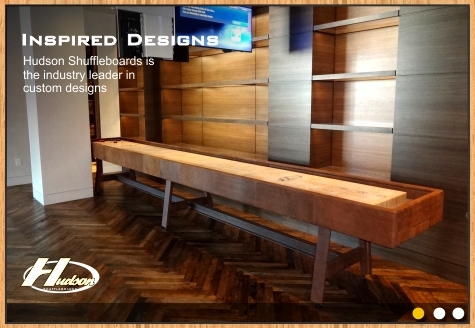 We specialize in designing and building your dream shuffleboard. If you have a Custom Table or design in mind and want it made by Hudson Shuffleboards 100% in the USA, email us or call 714-988-0001 for a quote. Dear Mr. Hudson - I wanted to express my overwhelming appreciation for your company and your reseller channel support. We will be showing this off and complimenting Hudson forever. I can�t thank you enough for taking care of us. As a fellow business owner, I know it�s not what you profess about yourself, but rather what others say and I say well done by all. Hudson Shuffleboards is happy to welcome Nitelife Billiards. Nitelife Billiards has been serving the Western slope of Colorado and Southeast Utah since 1992. If you're in the Grand Junction area and looking for a Hudson Shuffleboard, stop by Nitelife Billiards! From the playing surface to the seal and finish, Hudson Shuffleboards builds a better board. Check out the features and attributes and you'll quickly be convinced. We'll start with the shuffleboard's primary element, the playing surface. The playing surface on a Hudson Shuffleboard are constructed with rock-hard maple, which is hand selected. It is glued and milled in-house and never outsourced. All planks are finger-jointed lengthwise, a characteristic found only with Hudson Shuffleboard.